In OOP/OOD, whenever we have a class (let’s call it the consumer) that uses a functionality provided by another class (let’s call this the provider), we have what is called a dependency. The consumer class needs a reference to the provider class in order to be able to access its functionalities. The easiest and most intuitive way to achieve this, is for the consumer to create an instance of the provider class calling one of the constructors of the provider (i.e. to “new” the provider). This creates a tight coupling between the consumer and the provider. Changes to the provider class might require changes to the consumer class as well. Once you depend on interfaces only, you’re decoupled from the implementation. That means the implementation can vary, and that’s a healthy dependency relationship. For example, for testing purposes you can replace a heavy database implementation with a lighter-weight mock implementation. […] So this approach gives you flexibility, but it also separates the really valuable part, the design, from the implementation, which allows clients to be decoupled from the implementation. This is actually only an ideal solution since the consumer class somehow needs to have a reference to an instance of the provider class and cannot directly instantiate the IProvider interface. A common solution is to introduce a factory in the mix, as show in the following UML diagram. The consumer calls the factory asking it to produce a concrete instance of the Provider class that implements the IProvider interface (the dotted line in the figure shows that, this way, the Consumer class gets a reference to the concrete Provider object). This eliminates the tight coupling between the consumer and the provider, but introduces coupling between the consumer and the factory, therefore it is still not an ideal solution. The generally accepted solution to this problem is to use Inversion of Control (IoC), in which object coupling is bound at run time by an assembler object. Using the service locator pattern is easy. A developer just needs to ask the IoC container for a specific service class. The IoC container looks to see if the request class has been configured and based on the lifetime management rules for the class it will either create a new instance or return a previously created instance to the requester. The major drawback to using this pattern is your code needs to direct access to the IoC container, which could introduce a tight coupling between your code and the API of the IoC container. Constructor Injection, in which the dependencies are provided through the class constructor. Setter Injection, in which the dependent module exposes a setter method that the framework uses to inject the dependency. the Service Locator hides the dependency from a class, causing run-time errors instead of compile-time errors. Look again at the tiny example of Service Locator few paragraphs above, and imagine that the Consumer class is something that we didn’t code ourselves and that we got from a third party in a DLL assembly, without the source code. As soon as we look at the constructor, all we can see from the outside is that the class has a constructor with no parameters. When we try to call it, though, we get an exception at run-time, because we have not properly configured the IoCContainer before calling the constructor of the Consumer class. IoC containers take a simple, elegant, and useful concept, and make it something you have to study for two days with a 200-page manual. I personally am perplexed at how the IoC community took a beautiful, elegant article by Martin Fowler and turned it into a bunch of complex frameworks typically with 200-300 page manuals. I try not to be judgemental (HAHA! ), but I think that people who use IoC containers are (A) very smart and (B) lacking in empathy for people who aren’t as smart as they are. Everything makes perfect sense to them, so they have trouble understanding that many ordinary programmers will find the concepts confusing. It’s the curse of knowledge. The people who understand IoC containers have trouble believing that there are people who don’t understand it. The most valuable benefit of using an IoC container is that you can have a configuration switch in one place which lets you change between, say, test mode and production mode. For example, suppose you have two versions of your database access classes… one version which logged aggressively and did a lot of validation, which you used during development, and another version without logging or validation that was screamingly fast for production. It is nice to be able to switch between them in one place. On the other hand, this is a fairly trivial problem easily handled in a simpler way without the complexity of IoC containers. I believe that if you use IoC containers, your code becomes, frankly, a lot harder to read. The number of places you have to look at to figure out what the code is trying to do goes up by at least one. And somewhere in heaven an angel cries out. IoC Containers are also good for loading deeply nested class dependencies. For example if you had the following code using Depedency Injection. If you had all of these dependencies loaded into and IoC container you could Resolve the CustomerService and the all the child dependencies will automatically get resolved. 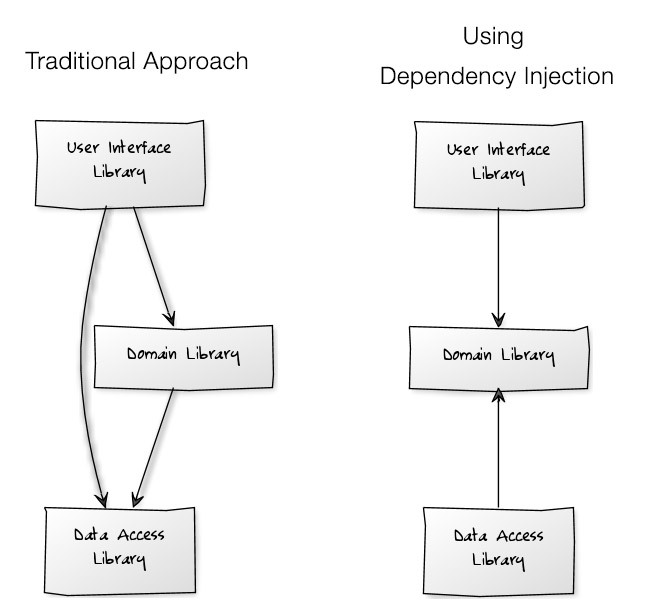 As it often happens, my quest brought me back to another post by Mark Seemann, and so I finally decided to buy his book “Dependency Injection in .NET” – if not for anything else, just to show my appreciation. Turned out to be a very good decision, mostly because Mark has the uncommon talent to explain complex software engineering concepts in a way that would make them more or less understandable even by a person who is not a software engineer. the Null Object design pattern – which states that, instead of using a null reference to convey absence of an object (for instance, a non-existent customer), one uses an object which implements the expected interface, but whose method body is empty. The advantage of this approach is that a Null Object is very predictable and has no side effects: it does nothing. the Decorator design pattern, which allows to intercept one implementation with another implementation of the same interface. This pattern is designed so that multiple decorators can be stacked on top of each other, each time adding a new functionality to the overridden method(s). the Adapter design pattern, which can be used to match two related, yet separate, interfaces to each other. And that’s just in the first chapter. Following his reasoning behind every architectural choice was an eye opening experience. Nonetheless, while the exercise was incredibly useful, at this point I really didn’t need him to convince me that using DI is better. I already knew that. Remember, at this point, I still haven’t found the answer to my question: “what is the difference between using the Service Locator anti-pattern and a DI Container?” In other words, I need to learn more about using DI containers, in particular where to use them and how to use them. You shouldn’t attempt to compose classes in any of the modules because that approach limits your options. All classes in application modules should use Constructor Injection and leave it up to the Composition Root to compose the application’s object graph. Any DI Container in use should be limited to the Composition Root. I think this is a good place where to close this long post. The quest continues, obviously, but I think I have shared enough information and resources to allow you to take it from here and continue on your own. I would love to hear your opinions and ideas in regards, so please leave those in the comments to this post. This entry was posted in OOP. Bookmark the permalink.